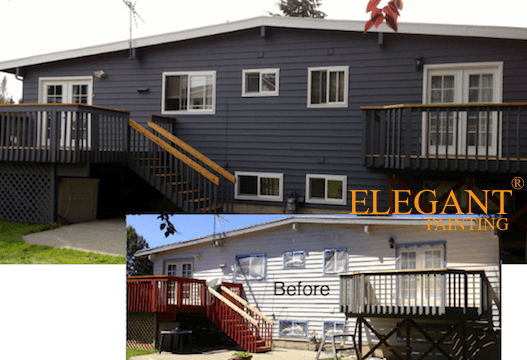 Complete exterior, including doors, windows trim, decks, and railings. 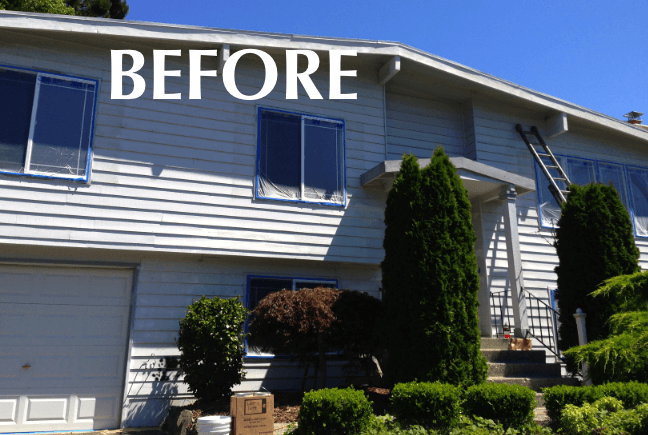 Our power washer was able to remove Bee’s nests, spider webs, and that invisible layer of pollution that will otherwise mix into the paint and alter the formula. We also had plenty of cedar bleed through that we removed using our standard house bleach/TSP solution. We also removed some loose paint from the siding and railings. We do not expect the pressure washer to remove all the loose paint, but it does give the scraping and sanding a head start. After scraping and sanding, we applied one solid coat of oil based primer by hand. We like to use brushes and roller to make sure the primer is forced into the grain. front verge boards and beams were the focus of our attention, although we did find a fair amount of peeling paint on the siding as well. As always, we take great care to protect windows, decks, plants, and concrete surfaces. Both coats are always back-rolled to ensure proper adhesion. 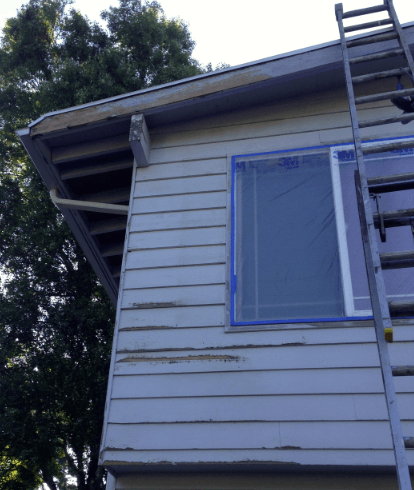 Back rolling removes any air that might be trapped between the siding, and the fresh coats of paint. 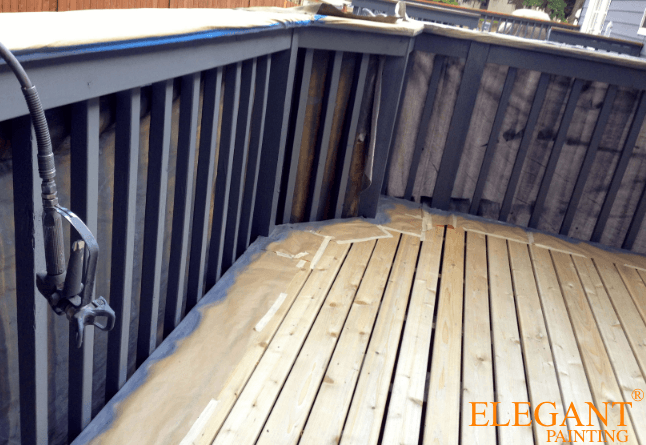 railings were prepped using the same procedure as the house, while the deck boards were completely stripped. 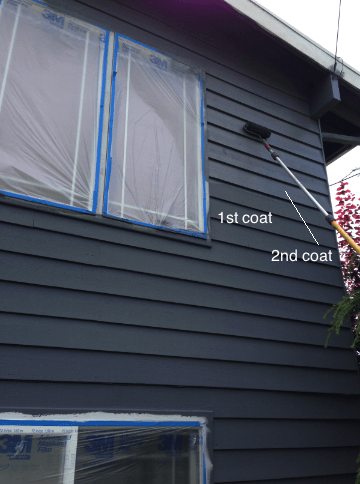 When the water pickets are previously painted, or simply old and unsightly, we paint them. 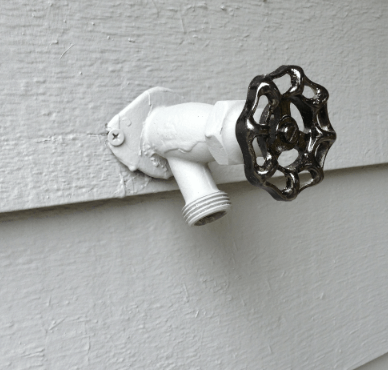 The handle is painted using Rust-Oleum metal paint, while the body of the hardware is painted with the house paint. 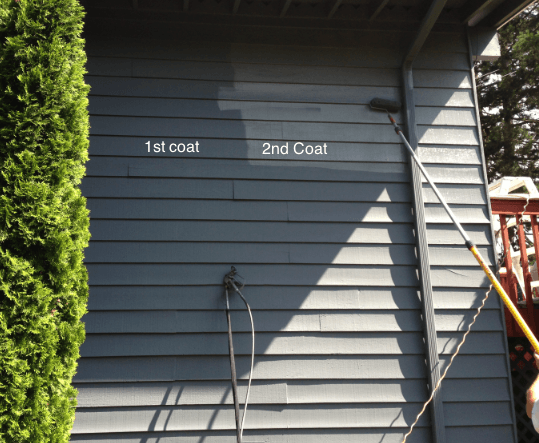 Posted in Painting Progress Report and tagged cedar deck, cedar shake sealers, cedar stain deck, chelsea gray exterior, cost for fiber cement shingles siding, deck stain colors, dilution of twp 101, door painters bellevue, sanding cedar deck, WA.